Any boat in possession of an IRC rating certificate. Unendorsed certificates are acceptable as are certificates up to 1 year old providing no modifications have been done to the boat. Class 2 is made up of boats that do not wish to fly a spinnaker. Detail on the conditions for racing in class 2 are currently under review. 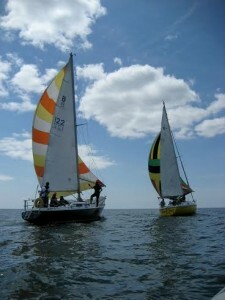 The organizing authority for cruiser racing is Waterford Harbour Sailing Club. Cruiser Racing will be governed by the Racing Rules of Sailing [RRS], the prescriptions of the ISA, IRC and ECHO handicapping system Rules, except as any of these are changed by these Sailing Instructions [SIs]. Eligibility requirements for owners or owners representatives require that they must be current members of WHSC and the ISA. Competitors are reminded that no individual or body involved in the organisation of this racing accepts any liability for injury or damage. Each owner or owners representative must ensure that his/her boat is covered by a policy of Third Party Indemnity Insurance of not less than €2,000,000. Entries are accepted on the basis that in no circumstances will any liability for injury to person(s) or property attach to the Officers, Trustees, Committee or Members of Waterford Harbour Sailing Club. All competitors are subject to the rules of WHSC. Class 1 racing will be for IRC certificated boats only, Progressive ECHO results will be given for White Sails class. All boat owners must be paid up full members of Waterford Harbour Sailing club to obtain results. The daily courses for Classes 1 and 2 will be if possible posted on the Notice Board at the Clubhouse. These will include the time of First Gun and the VHF Radio channel if any. All competitors are required to have a working VHF radio on board their boat and should have it tuned to the designated working channel. This will normally be Channel 13. Owners are advised to fit a deck speaker. The Racing Marks may be designated on the Notice Board. The sailing area has 5 fixed marks which can be used to make up part of a course. The Committee Boat will normally be “Club Red” or a RIB rigid rescue craft. The start line will be the flagpole on the Committee Boat and an outer limit mark. If an inner limit buoy is laid off the committee boat, no boat may pass between the inner limit buoy and the committee boat at any time. Code Flags 1 & 2. Five minutes before the starting signal, Class Flag(s) shall be displayed and a sound signal made. One minute before the starting signal Code Flags “P, I or Black” shall be lowered and a long sound signal made. The starting signal shall be the lowering of Class Flag and the making of a sound signal. A boat attempting to start later than 10 minutes after her starting signal will be deemed to have retired. Times shall be taken from the visual signals; the absence of a sound signal shall be disregarded. In the event of a General Recall the First Substitute pennant will be flown. For an Individual Recall Flag X will be shown. This may be announced on vhf. Decision whether a boat is OCS made by OD is final. two sounds), the finishing line shall be at a rounding mark, between the mark and a staff displaying flag S.
But if this is not practicable the race committee may shorten or change the course by communicating the changes of the course over VHF channel 13. The race committee will make reasonable effort to inform all competitors, but will not take responsibility for any boat not hearing course changes. 12.1 The finishing line will be as determined by the Race officer. A boat which retires from a race shall inform the committee boat or a rescue boat as soon as possible. Protests shall be written on forms available at the race office and delivered there within 60 minutes from the time of the last boat’s finish in the last race of that day. In addition to RRS 61 sailors shall notify the committee Boat of their intention to protest on completion of the race or when retiring . this should be confirmed by displaying a red flag. Protests forms are available from the race office . protests and requests shall be delivered there within the appropriate time limit. For each class the protest time limit is 60 minutes after the last boat in that class has finished the last race of that day. Any alteration to the Sailing Instructions will be posted on the Notice Board at the Clubhouse. It is the sole responsibility of each competitor to ensure that they have appraised themselves of any such alterations. The Race Officer may postpone, abandon or restart races but may not cancel or re- schedule them. The Cruiser Captain or his nominee may re-schedule races or cancel them. The low point scoring system in accordance with RRS Appendix A shall apply. OCS, RAF, DSQ and DNS = 1 point plus number of finishers for the race. DNC = 1 point plus number of entries for regatta. Ties will be in accordance with RRS Appendix A2.3. Boats which do not come to the start line (DNC) will be given a score which is 2 points lower than the score awarded to the last boat which successfully completes the race. All competitors are required to wear Life jackets/Personal flotation devices at all times when racing and to comply with Merchant Shipping (Pleasure Craft) Lifejackets and Operation)(Safety) Regulations 2004. All competitors are required to have a working VHF radio with a licensed operator on board, in date flares and an adequate Man Overboard retrieval system. Competing yachts may be subject to periodic inspections to ensure minimum safety requirements on the vessel. Competitors are reminded that all commercial shipping has right of way within the harbour area. All boats shall keep away at least 100 meters of vessels under way and 50 meters of vessel at anchor. Competitors should avoid crossing ahead of commercial vessels that are under way in the fairways. Large vessels often have blind spots dead ahead of + meters. Boats finding to have been in breach of staying clear of commercial shipping will be disqualified from the league or event they are competing in at the time of the incident. The safety of a boat and her crew is the sole and inescapable responsibility of the owner(s) or the owner’s representative whose obligation it is to ensure that the boat is fully found, seaworthy, manned by an experienced crew and equipped with all the necessary safety equipment. Neither these Sailing Instructions nor any action of the organizing authority in any way limits or reduces the complete and unlimited responsibility of the owner(s) or owner’s representative. Boat owners and competing crews undertake that they are adequately insured against loss, damage or injury to persons, boats or equipment at all times and however occurring and shall maintain adequate third party insurance cover. No responsibility will be accepted by Waterford Harbour Sailing Club, its members, servants or agents, nor those officials or members connected with the event for any loss, damage, injury or other claim of whatever nature howsoever arising or caused in connection with participation in, or intended participation in, this racing..